Encarnacion 5, 29200 Antequera, Spain. Charming hotel in the heart of Andalusia. The Coso Viejo Hotel is a nice and charming establishment located in an old house from the 17th century, carefully reformed. 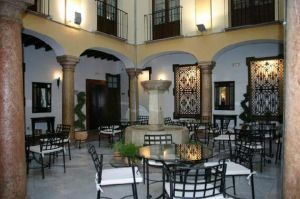 This hotel is situated in the historical city of Antequera, in the North of the Malaga province and on the route of El Legado Andalusí. The hotel guests can enjoy the horse riding or the hiking in the next Natural Reserve of Torcal of Antequera. 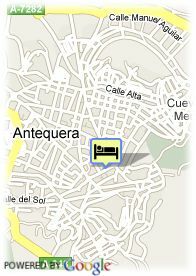 Moreover, the Coso Viejo Hotel is located at just 3 km from the Antequera Golf Court. Its 42 rooms are designed in a hospitable typical Andalusian style, being equipped with all the necessary comfort. Enjoy its excellent views over the Castle and the Muslim Fortress of Antequera. Furthermore, the hotel also offers a reserved place to organize events and work reunions. And in its restaurant, you could taste a great selection of the best gastronomy from Andalusia. Notice: The dormered rooms have all double beds. They have a sloping ceiling, and the window is located on the highest part of the room. They are equipped with the same services as the rest of the rooms. The only thing that makes them atypical is their sloping ceiling.